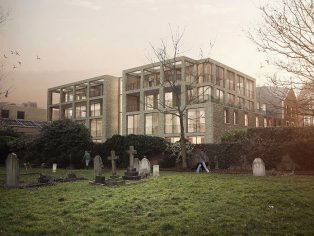 Overlooking the Paddington Old Cemetery and located next to Queens Park, the project – 40 percent of which will be affordable housing – sees the bones of a 1930s furniture depository retained whilst creating a landscaped oasis to the rear and a series of interconnected walkways and terraces inside. The existing building wears its architectural history on its sleeve. Many original decorative features remain on the main street facade, including pilasters, frieze and window surrounds. The scars of Second World War bomb damage are still evident to the rear and the proposed development is characterised by a series of sensitive additions and careful alterations, including large windows and varying brickwork. The architects seek to celebrate both the building’s noble industrial heritage and explore how it can respond to the needs of 21st Century living. Two new floors will be added to the building, raising it to the same height as its neighbours with homes ranging from studios to 3-bed family-sized duplexes offering an enviable variety of living spaces in a highly desirable West London location. 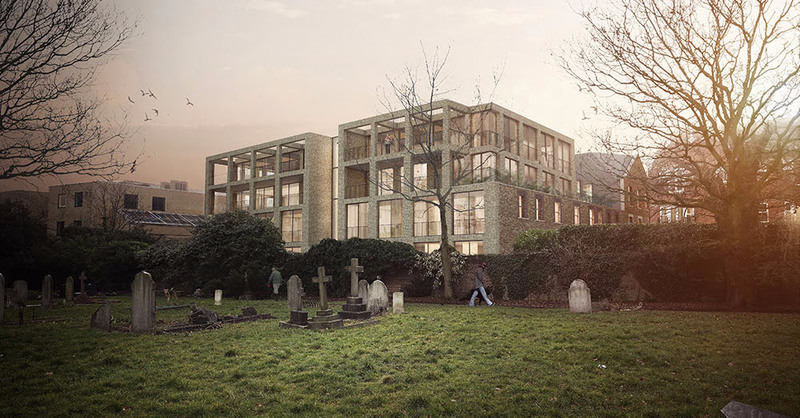 Each home will be accessed by a series of elevated walkways set within an internal landscaped courtyard, which also contains the ruined walls of the existing building and allows natural light to pour into the interior spaces. In addition to the internal courtyard, all dwellings on the ground, second and third floor will have private terraces, the building is set back along the street edge to include refined planting and the rear of the development will boast a lush communal green space and rain garden designed by landscape architects, FFLO. This carefully considered approach to green space, coupled with unobstructed views over nearby Queens Park and Paddington Old Cemetery, will make the development a rare urban oasis.